Recently, I was lucky enough to spend a few days in Munich, Germany. It’s a wonderful city in a wonderful country and a very unique place too. Being relatively close to Italy (a three hour train journey to Venice, with the train service in Germany making British rail look like a boy’s toy train set – with a few pieces missing) Munich’s houses have the wonderful terracotta roofs of an Italian village and the wide streets of relaxed Roma but with the added, and distinctly German attributes of plenty of beer, chapters of history and a scattering of Bavarian lederhosen. During my stay in the Bavarian capital, between the big slabs of pork with dumplings, the glorious Gothic Rathaus and the ‘umpa-umpa’ bands, I kept noticing that there is only one thing more definite than your train arriving on time; older occupants would always be dressed with elegance. Every time I saw any male or female aged 50+, they would be dressed with style, grace and an awareness of what to wear, how and with what. Having now returned to the Great British Isle, waiting for my now-30-minute-late train, I look around to see men that have more wisdom, experience and a CV the length of a loo-roll wearing trainers with baggy chinos, above which is an Iron Maiden t-shirt, still shrunk by the sweat from that amazing gig. Oh, and let’s not forget the haircut that should only be seen in the latest Tudor documentary. It’s the last in our ‘Dressing Your Age’ series; FashionBeans’ guide to creating an age appropriate wardrobe that will help you feel like the confident, well dressed man that you are – no matter what your age. But now FashionBeans is going German; following the example of Munich’s stylish pensioners, we aim to create an older generation full of polished leather, fitted jackets and pressed shirts, keeping the man looking and feeling younger. This series has been centred around the ethos of dressing your age to look younger, not dressing younger to look younger. Knowing what to keep from last year’s wardrobe and when to say Auf Wiedersehen is how we try to keep you looking stylish and not like a bemused fashion fad. Some would argue that they can still look fantastic in that shell suit, and if so, keep rocking it. However, dressing according to our more general advice will keep those new to the fashion world, and the seasoned pro, on the right tracks. The man we aim this article toward is the general 60 year old or older. Of course, not all the advice given will suit your personal aesthetic, but do take a look and choose the advice that best suits you. Being comfortable in what you wear is the most important thing, and putting an individual twist on our advice will keep you ahead of the Vuitton’s next-door. Now hold your Weiner schnitzel for one second! You may be thinking, just because I’ve turned sixty, it doesn’t mean I want to dress like I’m eighty! Although this article is for ages 60+, a man’s style should always be continually evolving – being influenced by latest experiences and discoveries. However, as we get older, the general style rules that will keep you looking the best you can, remain rather static – that’s what makes them so reliable. So if you’ve just turned sixty don’t start to feel like you’ll be wearing the same thing for the next thirty years, indeed you can even look back at the previous articles in the series for some guidance, as many of the previous tips will relate to the older gent. All the way through this series we have featured a variety of looks from recent fashion retailer lookbooks and campaigns. Although all the outfits had a somewhat timeless nature, it was hard for those of an advancing age to imagine themselves in the same outfit due to the models young (often teenage) age. Usually in ‘Wardrobe Tips’, I would start off talking about glorious outerwear or the importance of the suit – but when I told my 63 year old father that I was writing this article, the first thing he said was, ‘when you get to my age, underwear needs to give plenty of support’. Being aware of Newsnight presenter Jeremy Paxman’s complaint to Marks and Spencer on the subject, underwear is clearly of the greatest importance. As such, let’s plough into the glamorous area of the brief, boxer and underwear. The frustrating thing with buying underwear is that they can’t be tried on in the store before purchase and that although the waist measurement is the same with all underwear brands, other measurements vary from brand to brand. As such, experimenting with different brands and with different styles until you find the fit for you is important. Be sure to invest in your underwear. The cheaper pieces will usually not be up to the job, be painful and a waste of money. Underwear can be bought in an array of materials and each will make people react differently. However, in general, cotton will be comfortable and durable, whilst wool will be warming in the winter months. If there’s one item that you’re really willing to invest in, I would suggest getting the right overcoat. This ultimate autumn/winter piece was the highlight of Miuccia Prada’s latest collection, and will always be on the runway. Coming in so many different styles (double breasted, ticket pockets, cropped etc.) choosing the right piece could take some time, but is worth it in the end. Be sure that the fit on the shoulders is perfect and rest will work itself into place. Such a piece could soon become a trademark of your style, so take a look at the product picks below for inspiration on choosing the right coat for you. A rule that I think relates over all the ages, but perhaps especially for those 60+, is that camel is your best friend. It’s a colour which immediately makes the wearer look not only stylish but fashionable too. Camel is always seen on the catwalks, so it will always look like you’ve got your finger on the fashion pulse. Although you see camel more often at the A/W catwalks, I see camel as the best friend of someone 60+ during warm weather. It’s during the summer that the 60+ wardrobe can be particularly difficult. 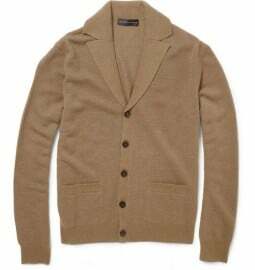 Bright colours can often make the wearer look both older and desperately trying to cling to the latest trends, so instead, why not wear a thin, soft cashmere jumper in camel over a denim/blue casual shirt and some stone trousers? This will keep you looking stylish and feeling comfortable in the heat. It’s a wonderfully versatile colour and can be worn as a rollneck, suit jacket, trousers, jumper and so much more. It also comes in many different hues – such as beige, tan and cream. However, with so much choice it would be easy to go too far. It is a statement hue due to its luxurious nature, and as such, limiting yourself to one camel piece in an outfit might be wiser and look better than wearing a larger combination of the same colour. Having kept everything up top looking suave, it’s often the shoes that can ruin the look of the 60+ year old. Shoes become almost a taboo subject by this age and are something that becomes a mere necessity, not a style piece. The key is to stick to the classics – the silhouettes that have been tried and tested for years. The worry is that these will make you look more fuddy-duddy than stylish gent, but choosing a style with a contemporary spin will make you look style aware, rather than out of the loop. Why not try a suede version in a navy blue instead of black? Rich burgundy leather instead of brown? Maybe a shoe with a modern twist, such as a monk strap/loafer hybrid or two-toned colouring? As my father has been telling me: ‘Once you reach my age, shoes need to be sturdy, with a thick sole’. Unfortunately, this need for sturdy footwear can often drive the male toward sturdy shoes that lack in style. Luckily, designers have recently been producing classic shoe silhouettes with thicker vibram type soles, especially during the A/W collections. Our favourite shoe for those 60+? We’re torn between the monk strap and the loafer, check them out. Often, a gentleman in his 60s or above can often get stuck in the suit rut. It’s not the worst rut to get stuck in, as wearing a suit on every occasion is something that people do, and do very well. However, to keep things fresh and interesting, we’ll look at how the same suit can be used for both formal and casual situations. The time of the rigid business suit is over; it’ll only age your appearance. Instead, try a deep blue, burgundy, stone or camel suit. 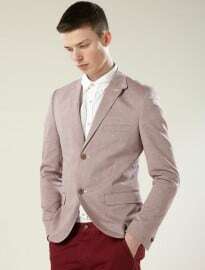 This will add some much needed colour to your outfits and make the transition between formal and casual easier. For a formal look, the classic knitted tie-cardigan-crisp blue/white shirt with the suit trousers and a pair of monk straps will keep you looking sharp. To move to casual, change the trousers for a different coloured pair (read my tip on the 50s for help with this), the shoes to a more casual style and lose the tie. Purchasing versatile pieces that can be dressed up or down will save money, wardrobe space and keep a good variation in your style. Final Tip: always remember the pocket square. Changing it for casual and formal looks isn’t always necessary, but will make that variation more prominent. Formal outfits could incorporate a neat, square folded traditional white/silver version, which could be changed to a bolder colour for the weekend, stuffed in effortlessly for a hint of Sprezzatura. Some people like to keep two pocket squares in the pocket at one time for quick switching. 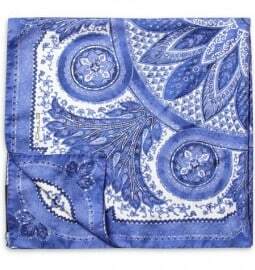 I find that a silk scarf – whether tied around the neck or flowing loose around a suit – can add elegance to any outfit. Try to buy a patterned scarf or something with colour as this will add flair that can otherwise be neglected from the wardrobe. They are a very versatile accessory, so don’t be afraid of introducing them into both your formal and casual wear. The Rolling Stone’s drummer shows all of the aspects covered above perfectly. His deep blue overcoat has a bold fur collar which, along with his pink top underneath, gives him an edge, elegance and a youthfulness. His use of the silk scarf has the same effect and is tied differently from outfit to outfit. He also has the casual looks nailed – a jacket in a more playful colour and material with a simple shirt underneath is so easy to implement, yet so effective. Although bold colours can make the wearer look older, don’t be put off, because accent colours can make you look younger. Try to find that balance like Mr Charlie Watts does above. Inject colour from under a dark jacket or coat or with accessories like a scarf, pocket square or socks. Even shoes have gone colourful this season, so why not take a look at them for some colouring? We’ve made it to end and hopefully cultivating that new wardrobe as you progress through your sixties is not quite so daunting anymore. It’s also the end of the ‘Dressing Your Age’ series and I hope you’ve enjoyed it. From the series, I think that all of us can learn that keeping to the classics will keep you looking stylish, no matter your age. They are the items that have been with us for years and are reinvented every season, evolving yet remaining a stalwart of the fashionable wardrobe. However, to remain ahead, to remain stylish, the best advice is to remain individual and comfortable in your clothing, meaning you remain confident in yourself. Harry Styles' Best Hairstyles (And How To Get The Look) From tween idol to enviable hair icon 13 Deep Questions Every Man Should Be Able To Answer By 30 Map out the rest of your days with a dream team of expert coaches dishing out the wisdom for free Does The World Really Need Unisex Fashion? There's finally a trend for everyone, but does it fit ...anyone?